You're probably familiar with the phrase "walk a mile in someone else's shoes." We tend to use it metaphorically but trying it for real can yield a whole new appreciation for the importance of a transportation system designed with every mode in mind, not just one. After all, even if you rely on a personal vehicle to get from one place to another you'll still be a pedestrian after you park the car. The same is true for "rolling a mile on someone else's bike." You may not use a bike for transportation but if you were to try riding from a neighborhood to the grocery store, your job site, or just the nearest transit stop, you'd experience how it feels to travel on a street or road that doesn't include provision for your mode. This understanding matters for our work on behalf of all Washington residents (including our future selves – when someday we're not able to drive ourselves where we want to go). Better biking and walking connections serve not just people who choose those modes, but also people using those modes out of necessity. 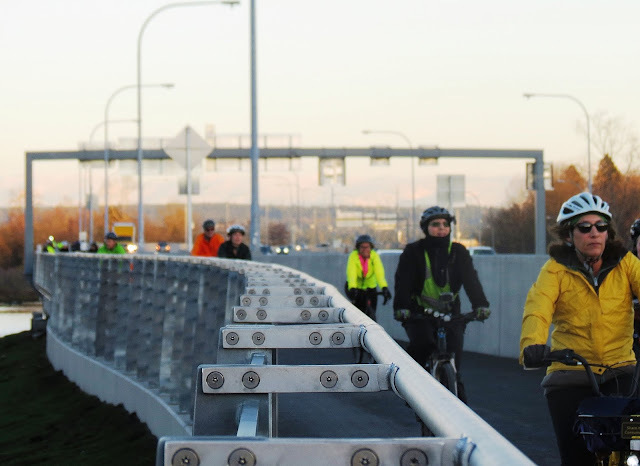 The opening of the SR 520 trail provided a key link for bicyclists and pedestrians across Lake Washington. That's more people than you might think. Over 22 percent – more than one in five – of people in Washington don't hold a driver's license. They may be too young, too old, have a disability that doesn't permit them to drive, choose not to drive, or face a legal barrier. Whatever the reason, they don't drive – and they're still using the transportation system. One of the fastest-growing reasons people don't drive? They can't afford to own and operate a car. We have a deepening opportunity gap in our state, particularly in the Puget Sound but growing everywhere. We must provide safety and mobility for the people who need it most to gain access to jobs, education, food, health care, and other essential goods and services. A bike can be the key that unlocks the door to opportunity but lack of comfortable, complete connections can keep that door from opening. These are the people biking to home from a late shift or on their way to an early one. The people carrying a bag on the handlebar to get their groceries home the only way they can, because a rack and bike bag aren't in the budget. The people whose headlights are dead because batteries cost money. The mom taking her kids to school by bike because the family has one car and it's in use. The senior citizen pedaling slowly to the doctor's office because their reflexes aren't up to the speed of driving decisions any more. When we design and build better connections for biking, or make it easier to cross state right-of-way to access the quieter, calmer local streets, we're working for them. For several years now Washington has led the nation in policies, infrastructure, education and funding to support people who use bicycles to get around – but there's more work to be done. As we celebrate Bike Month (pdf 644 kb) in May, let's consider what we can do differently to help all people get around, regardless of the mode they use. Imagine riding that mile "on another's bike" – while designing and building projects, and when approaching, passing or turning near a person on a bike. Let's make it safe and convenient for everyone to get where they want to be. I love love love this post. However, the selected picture missed the mark for me, considering the message behind the article.